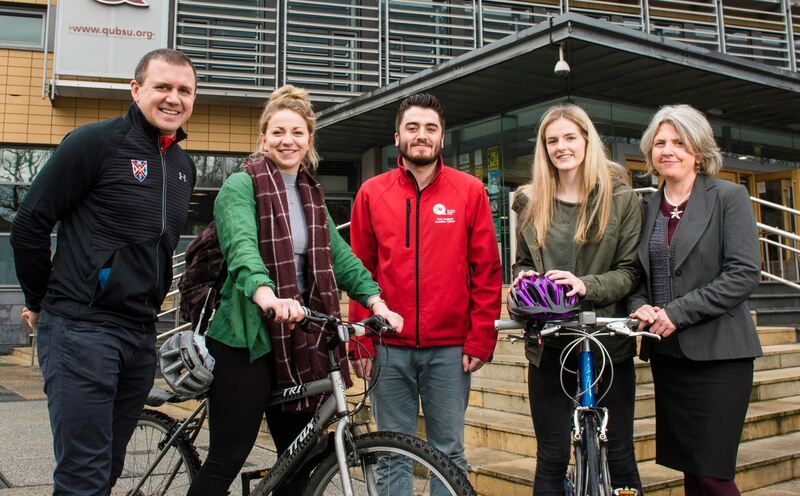 At the recent launch of Queen’s Active Travel Project it was announced that over 600 students will be ‘moving more’ as a result of initiatives aimed at encouraging them to take additional active journeys in and around the University campus. Funding of £9,559 was secured by Queen’s Development and Alumni Relations Office (DARO) for the Active Travel Project, through the Belfast Strategic Partnership’s Active Belfast Grants Scheme. The project will implement new and exciting activities for students to undertake active journeys in and around the Queen’s campus and the greater Belfast area. Speaking at the launch Kevin Murray, Sports Officer at Queen’s Sport explained: “This funding will support Queen’s Sport in expanding its current Active Campus programme targeting all students – particularly females – by providing new opportunities to live a healthy and active lifestyle through walking, running or cycling. Issuing a call for volunteers to help run the initiative, the Active Travel Project Co-ordinator Chloe McIlwaine, said: “We are looking for student volunteers to assist with the delivery of practical, information and nutrition sessions, so I would love to hear from anyone with an interest in running, cycling or nutrition. Various practical events and taster sessions will take place throughout the programme from ‘Couch to 5k’ for those students who would like to learn to run, nutrition workshops and cycling safety and information sessions that are open to students of all abilities. For further details on the Project please contact Chloe McIlwaine, tel: +44 (0)28 9038 7678 or visit www.queenssport.com. To find out more about supporting student projects at Queen’s please contact Naoimh Wilson on tel: +44 (0)28 9097 5039 or visit the DARO website. Media inquiries to Gerry Power, Communications Officer, Queen’s Development and Alumni Relations Office; tel: +44 (0)28 9097 5321. Caption (L-R): Kevin Murray (PE & Sport Development Officer), student Cathy Graham (Queen’s Ladies Hockey), Paul Loughran (VP, Queen’s Students’ Union), student Alice Christie (also Ladies Hockey) and Grainne McMacken (Active Belfast).